Fiji Airways is planning modest growth over the next five years as it focuses on further improving its profitability. The flag carrier has been profitable for four consecutive years and recorded a record half year profit in 1H2014 but CEO Stefan Pichler sees potential for even higher margins. Mr Pichler just completed his first year at Fiji Airways and has been concentrating on improving the group’s management structure and customer service. He also has implemented a new five-year business plan that focuses on sustained profitability with an average growth of only 3.5% per annum. Fiji Airways, which was known as Air Pacific until mid-2013, has benefited from widebody fleet renewal following the delivery of three A330-200s in 2013. In 2014 it has turned its attention to renewing the fleet at recently rebranded turboprop operation Fiji Link. The group completed a restructuring and turnaround in FY2011 under former CEO David Pflieger, ending several years of large losses. Fiji Airways has since been consistently profitable but on a relatively flat revenue base as the focus has been on fleet renewal rather than capacity growth. Fiji Airways reported a record underlying operating profit in 1H2014 of FJD17 million (USD9 million) compared to a roughly break-even result in 1H2013. Profits were between approximately USD6 million and USD13 million in the fiscal years ending Mar-2011, Mar-2012 and Mar-2013. During 2013 Fiji Airways transitioned to a fiscal year matching the calendar year and reported a profit of FJD15 million (USD8 million) for the nine months ending 31-Dec-2013. Mr Pichler told the CAPA Australia Aviation Summit in Aug-2014 that Fiji Airways is targeting an underlying operating profit of FJD26 million (USD14 million) for the full year in 2014. Profits are expected to continue to improve incrementally over the next three years and reach FJD67 million (USD36 million based on current exchange rate) in 2017 as part of a target to achieve operating margins of at least 8%. Fiji Airways has not provided any revenue figures yet for 2014 but the group generated FJD541 million (USD290 million) in revenues for the nine month period ending 31-Dec-2013. Group revenues were FJD691 million (USD370 million) in the fiscal year ending 31-Mar-2013, up 6% compared to FY2011/12, 15% compared to FY2010/11 and 27% compared to FY2009/10. Fiji Airways accounts for about 95% of the group's revenues with Fiji Link and its 39% stake in a local resort accounting for the remaining 5%. While impressive, the profit improvement recorded in 1H2014 was not surprising as it represented the first six months since the airline completed the renewal of its widebody fleet. Fiji Airways took delivery of its first A330-200 in Mar-2013 and the third and final aircraft from its 2011 order in Dec-2013. The third delivery allowed the carrier to phase out its fleet of two 747-400s. The transition to the A330 has provided significantly improved operating economics and also has enabled Fiji Airways to improve its schedule through additional frequencies across its network without significant changes in overall capacity. For example Los Angeles was increased from four times weekly to daily while a third weekly frequency was added to Hong Kong. Fiji Airways currently uses its A330-200 fleet on its daily Los Angeles service, its thrice weekly Hong Kong service as well as on some of its 14 weekly flights from Nadi to Sydney and 11 weekly flights from Nadi to Auckland. These are all among Fiji Airways’ six largest international routes. The A330 has proven to be the right size aircraft for most of these routes as Fiji Airways’ load factor has improved significantly. 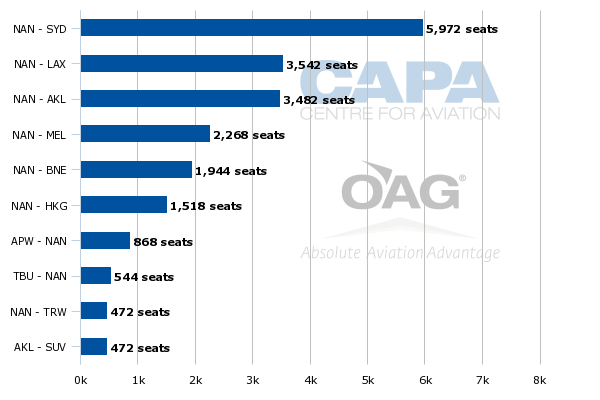 The carrier reported an average seat load factor of 82% in 1H2014, up 7ppts from 75% in 1H2013. Passenger numbers grew by 4% to 580,000 driven entirely by the load factor gains. Yields also have improved. 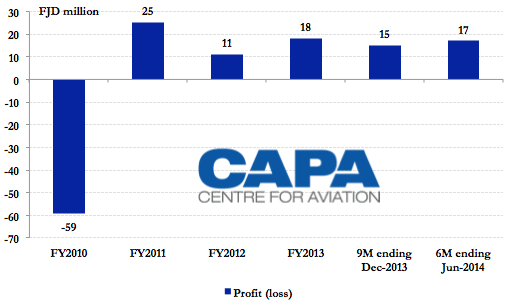 Fiji Airways reported a 7% increase in unit revenues or RASK in 1H2014 while unit costs or CASK were down by 6%. The combination of lower costs, improved yields and higher load factors – all of which are directly related to the introduction of more efficient widebody aircraft – were likely the key contributors to the improvement in profitability. The A330 also has ushered in a significant product improvement. The aircraft features 24 angled lie-flat business class seats (compared to old recliner seats on the 747-400) and 249 economy class seats with seatback on-demand in-flight entertainment monitors. Fiji Airways used the transition from 747s to A330s to rebrand in Jun-2013 from Air Pacific, reinforcing the airline’s improved product. The new brand is intended to illustrate the carrier’s Fijian roots and focus on the Fiji market. Fiji Airways continues to carry some transit passengers, including on regional connections to other island chains in the South Pacific. But it is keen to avoid competitive transit markets such as Australia-Honolulu or Australia-Los Angeles and is predominately focused on carrying passengers heading to or from Fiji. Mr Pichler told CAPA after speaking at the CAPA Summit that 81% of Fiji Airways’ traffic is heading to or from Fiji (includes passengers with domestic connections). Of the remaining 19%, a majority connects beyond Los Angeles to other destinations in North America, primarily using codeshare partner American Airlines. About 4% to 5% connects at Nadi to other South Pacific islands. Mr Pichler foresees Fiji Airways playing a continuing role as a hub carrier for the South Pacific as it is the largest airline in its region. Fiji Airways currently serves the South Pacific countries of Kiribati, Samoa, Tonga and Tuvalu. Other carriers from the region are very small and rely on the larger operators to provide long-haul services. But Fiji Airways’ South Pacific hub role is a niche and Fiji Airways will continue to cater predominantly to passengers heading to or from Fiji. Fiji Airways does not see the point of pursuing rapid expansion, which would likely require competing more aggressively for transit traffic as well as for passengers in the competitive Australia and New Zealand markets. 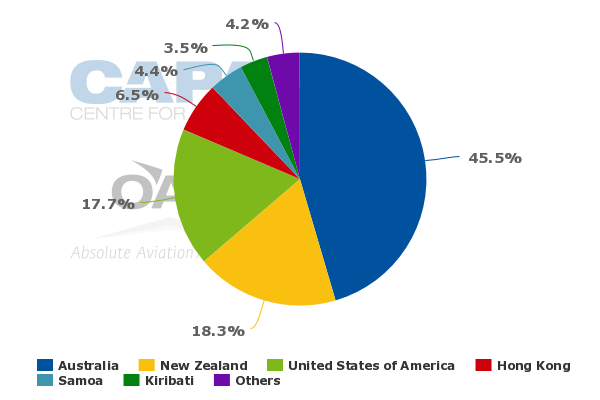 Australia and New Zealand currently account for 64% of Fiji Airways’ international seat capacity. While Fiji Airways is the only non-stop carrier linking Fiji with Los Angeles or Hong Kong, it has competition in markets to Auckland (Air New Zealand), Brisbane (Virgin Australia), Melbourne, (Virgin Australia) and Sydney (Jetstar and Virgin Australia). Competition in these markets is now relatively rational but additional capacity could upset the balance. Fiji Airways would be at a disadvantage in any fare war as it does not have the scale or the capital to withstand prolonged losses. Nadi to Sydney, Auckland, Melbourne and Brisbane are all among Fiji Airways’ five largest routes and all served with at least one daily flight. Fiji Airways also operates one weekly flight from Nadi to Christchurch. In addition it serves the Auckland and Sydney markets with two weekly direct flights from the secondary Fijian destination of Suva. Modest growth is clearly the sensible strategy. Mr Pichler said in an interview with CAPA TV that the airline’s new five year business plan envisions a compounded annual capacity growth rate of only 3.5% per annum. “We prefer to be in a position of sustainable profitability. We don’t want to lose money in the next GFC”, Mr Pichler said. Mr Pichler emphasised that the five year plan is not a growth plan but a financial plan as the focus is to grow the bottom line. Capacity, network and staff expansion will only be considered at a later phase if the right foundation is in place. This somewhat contradicts a Jan-2014 announcement from Fiji Airways which outlined seat growth of 35% over the next five years, driven by fleet growth of 25%. The 3.5% per annum capacity growth figure for the next five years provided by Mr Pichler in Aug-2014 is more practical. Since taking over as Fiji Airways' CEO in Sep-2013, Mr Pichler has reinforced the boutique carrier’s model and worked on improving the management structure. Management performance has been incentivised and profit sharing with the entire workforce has been initiated, improving engagement and motivation. Engagement with customers also has improved as the focus of the business has changed from looking inside to outside. The group has also invested significantly in raising the profile of the Fiji Airways brand globally. The group recently extended the new brand to its regional operation, which changed its name from Pacific Sun to Fiji Link in Jun-2014. Just as the rebranding of Fiji Airways occurred as the A330s arrived, the rebranding of the regional operation has coincided with renewal of the turboprop fleet. Fiji Link so far this year has taken delivery of one ATR 42-600 and one ATR 72-600. Mr Pichler said a second ATR 72-600 is due in Dec-2014. He expects to review potential replacements for the carrier’s Twin Otters in about two years, completing the renewal of the entire Fiji Link fleet. The Twin Otter fleet is used in smaller domestic markets while the ATR fleet is used on larger domestic routes as well as on some international routes to neighbouring island groups. While Mr Pichler is clear focused on profitability over growth he does see longer-term opportunities for expansion. These could involve additional capacity in the carrier’s main three existing markets – the US, Australia and New Zealand. Asia, where Fiji Airways currently only serves Hong Kong, is also obviously an area of interest. According to industry sources Fiji Airways has already committed to leasing one additional A330-200 for delivery in 2016. The airline still has a lot of time to decide on potential routes but has been looking at San Francisco. As there is no US carrier serving the Fiji market, Fiji Airways is well positioned to grow as the US continues to expand as a source market. Having American as a close partner also would prove to be very helpful as Fiji Airways potentially looks to expand to the mainland US beyond its one daily flight to Los Angeles. Fiji Airways also operates one weekly flight to Honolulu, according to OAG. This is a small niche market using 737-800s but could have growth potential if its interline arrangement with Hawaiian Airlines can be expanded to a codeshare and cover Hawaiian-operated connections to the mainland US. In addition to American, Fiji Airways currently has codeshares with Alaska Airlines, Air New Zealand, Cathay Pacific and Qantas Airways. Qantas has a 46% stake in Fiji Airways which the Australian carrier has been keen for some time to offload, with the Fijian government being the most likely (and perhaps only) suitor. Fiji Airways’ continuing financial improvement and relatively bright outlook could make such a transaction easier to complete. Fiji Airways is in a relatively strong position. Over the past few years the small flag carrier has finally been able to carve out a sustainable niche. At least for now there is not much of a risk of derailment – although an airline of its size is always vulnerable to sudden changes in market conditions. It is important for Fiji Airways to maintain its focus and not get distracted by competing in competitive transit markets or putting too much capacity in a highly competitive market such as Australia-Fiji. One additional A330 would almost certainly result in a faster growth rate than the 3.5% now indicated by Mr Pichler. But by 2016 Fiji Airways will have earned the opportunity to expand again – as long as the overall strategy is not sacrificed and growth can be pursued without impacting profitability.